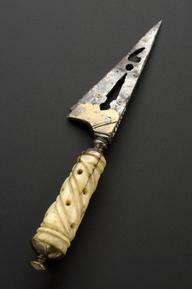 Bullet extractor, 16th century, steel and brass. Graduated matt black perspex background. Although attempts had been made to remove bullet-like projectiles when firearms had been introduced into warfare as early as the 1200s, only those near the surface of the skin could be treated. 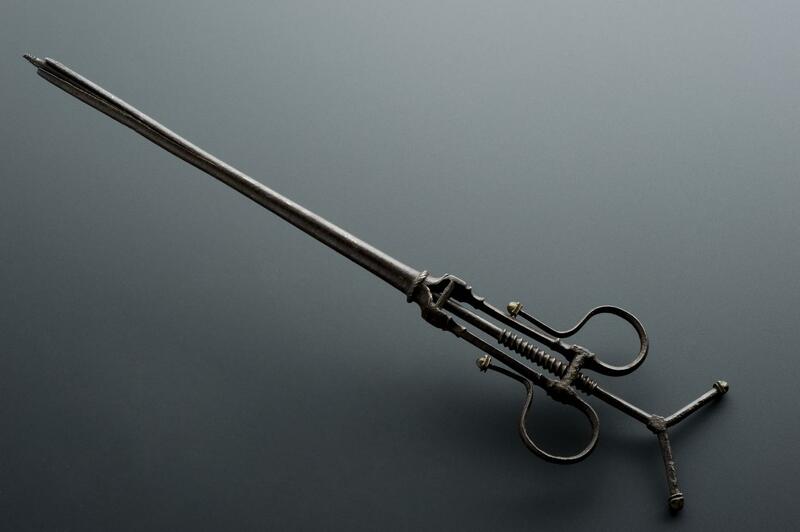 Special instruments for removing bullets only came into use in the early 1500s as firearms became increasingly sophisticated. Screw-type bullet extractors like this one have a hollow rod which contains a screw that can be lengthened or shortened by turning the handles. 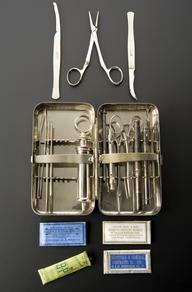 The instrument is placed in the wound and the screw lengthened to pierce the bullet to remove it. This bullet extractor is decorated with a brass inlay on the steel frame.